The 21st Oswestry Rotary Club Tree of Light was switched on outside Sainsbury's store in Oswestry on November 24th where it will shine out on shoppers until Twelfth Night during which time members of the public are invited to make a donation to the Club's annual Tree of Light Appeal in support of local charities. 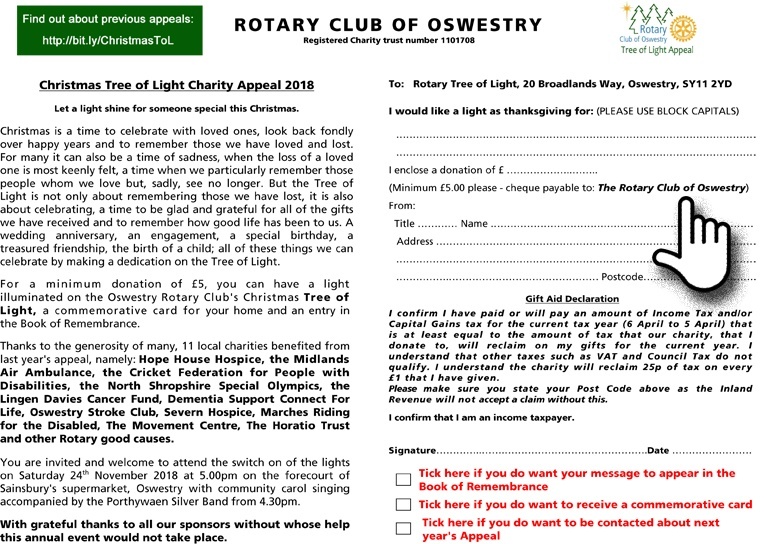 Supporters may collect a sponsor form in Sainsbury's or from Paperwrite in Oswestry to mark an important event in their life such as the death or a loved one or a birth, marriage, engagement or graduation. Thank you to this year's sponsors without whose generosity the Appeal would not be possible. The Switch On was performed by Rotarian Denzil Ellis who has seen the appeal raise over £6,000 pa in recent years. Denzil was helped by Father Christmas and his elf helper and the Oswestry School Interact group with a solo by Meredith Bryson and a reading by Una Kozic. Allister Moutrie, Sainsburys store manager, thought the whole event lovely as it was the first year that he had been able to take part and join in with the carol singing. Appeal organiser Mike Jones was delighted by the support on the evening and said: "The donations have been coming in by post over the last few weeks and we are delighted to be up over £3,000 already. The amount collected on the night is not yet known but with the help of the generosity of the general public we hope to top last year's total of £6,000 in this our 21st year!" 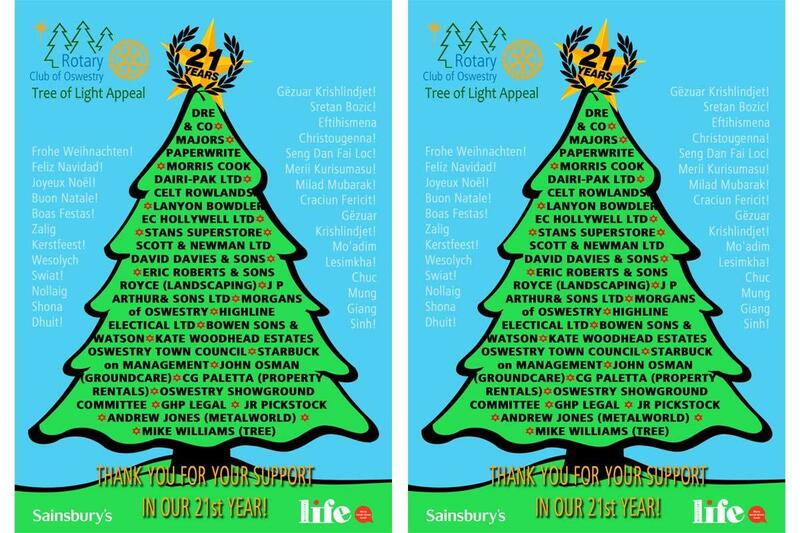 May I thank each and every one of you for giving up your time in supporting the Tree of Light yesterday, whether your were collecting or stewarding, the success of the switch on was due to your support. I was delighted to hear from the store manager that he thought the whole evening was lovely as it was the first year that he was able to take part and join in with the carol singing. He was also happy the way that the event on the forecourt was managed. What a joy it was to have had the support from the Interact group from Oswestry School with a solo by Meredith Bryson and a reading by Una Kozic what delightful young people they are and a credit to the school. It was lovely to have had Father Christmas and his little elf call in for a comfort break and a mug of tea on his long journey to Australia!! A number of our faithful members who have supported this event for many years and are unwell, we missed you and hope that you all get to feel better soon. At this stage we are unable to give a figure of what was collected yesterday. I know that a number of members may have sponsorship money that they would like to hand over to DD and the books are open until the end of January.